Whether you are a large group, an SME or a very small company in the paint and varnish industry, CDA has the packaging solution for you that is adapted to your sector and your activity. Labeller, filler, complete line and even monobloc, we design packaging machines adapted to the requirements of the paint and coatings market. The constraints of the paint and varnish sector are multiple and the packaging of finished products involves constraints for producers with extended product ranges. Special containers, multitude of formats, various materials, corrosiveness of the product, CDA adapts to the projects of paint and varnish producers according to the type of product or format: pots, buckets with handles, trays, boxes, and other containers with various materials (plastic, metal). CDA designs machines adapted to the requirements of the paint sector, including unique technologies to match the inherent specificities. Automatic loop lifting, welding detection for ultra-precise labelling… CDA has mobilized many technologies to develop machines capable of packaging products and containers specific to the paint and varnish sector. For a precise labelling of small to medium productions of paint buckets, varnish jars and other metal or plastic containers, CDA offers you a semi-automatic labelling machine adapted to your needs and constraints such as the lifting of the handle. An automatic labelling machine will enable SMEs wishing to optimize their packaging line to gain in productivity on the labelling of their buckets and paint jars. The technologies used by CDA ensure optimal labelling accuracy thanks to the detection of welding of metallic containers but also to the lifting of the handle. For the filling of your paints and varnishes, choose precision with CDA. A semi-automatic filling machine will answer the problems of small companies looking to optimize their production process. Regardless of the viscosity of your product, we have a solution for you. Increase your productivity with a CDA automatic filler. Depending on your production rate needs and the viscosity of your paints, varnishes and coatings, we will guide you to one of the filling machines we have designed to fill your liquids with the highest precision. For the automation of the packing process of your paints or varnishes: filling, capping, labelling, CDA offers complete packaging lines or “all-in-one” integral designs. The complete packaging lines are custom-made by our engineers, who will offer you the best solutions for your project. Our range of E-FILL CDA integral designs and monoblocks will allow you to automate all operations to fill, cap and label your products. In addition to the manufacture of your packaging machines, we also offer you complementary solutions to optimize your entire packaging line. Modular belt unloading tables, marking systems for your paint cans, our experts will be able to advise you. 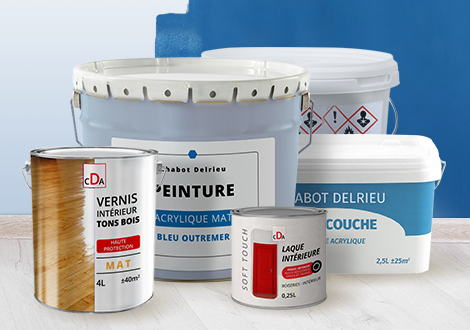 CDA, a French manufacturer of labelling machines, filling machines and integral designs, has been able to adapt to the projects of professionals in the paint and varnish industry by developing a whole range of machines that meet the specific needs of this sector. Our machines are appreciated by both small and large groups for their common characteristics: robustness, adaptability, precision and ease of use. VSEs producing small quantities and facing the growth of their production can choose to opt for semi-automated packaging solutions, through the purchase of a labeller and/or filler in order to optimize their production process. They will easily be able to rely on our range of semi-automatic filling and labelling machines, specially adapted to the characteristics of products in the paint and varnish sector, particularly with the presence of a handle lifter on our labelling machines. SMEs will find a wide range of automatic filling and labelling machines that meet their speed and precision requirements. Our machines can be adapted to many requirements such as product labelling based on the sealing of the container for perfect packaging. In addition, the scalability of our machines allows you to expand the range of your products with complete serentiy. Large groups wishing to acquire a new filling or labelling machine for the launch of a new product or to extend their range will also find a solution adapted to their needs within the equipment designed by CDA. Our machines can be easily integrated into an existing packaging line while maintaining their flexibility.